Christmas in the Kitchen & $500 Giveaway! Especially when she added in a PayPal $500 cash giveaway (see below to enter). I also knew immediately what I wanted to share with you all for the tour. It’s a space in my home that hasn’t received much love from me on the blog. 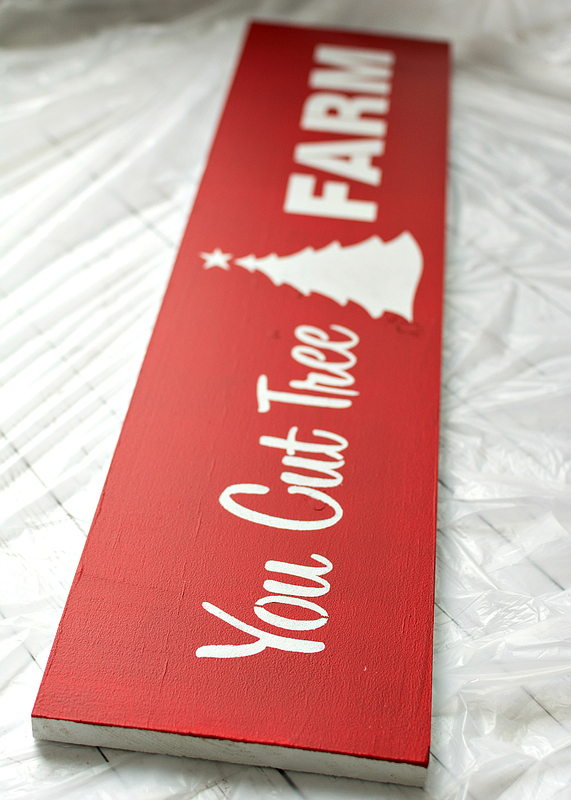 Well, until this past summer when I labored over it laboriously for months. 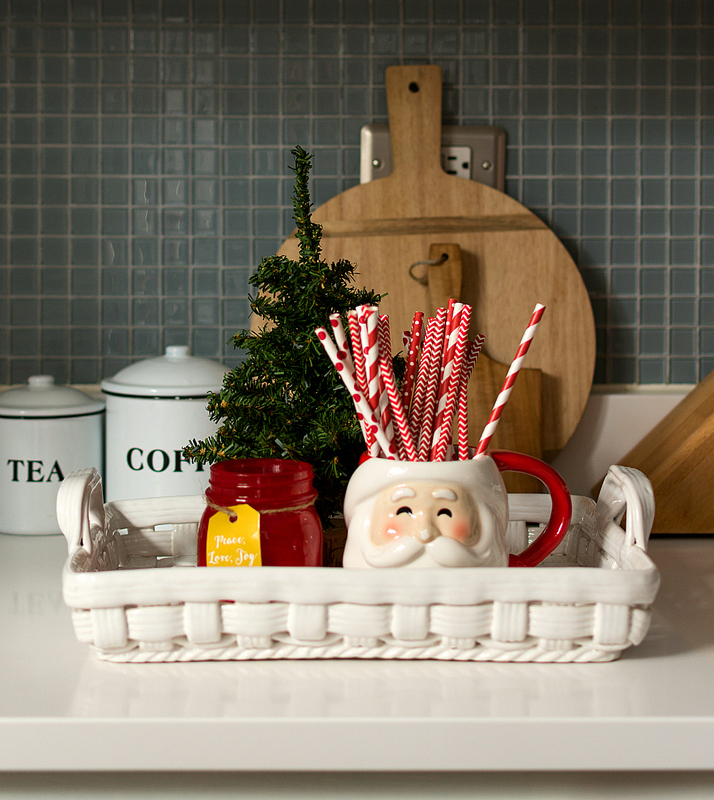 And to celebrate it’s transformation, I thought it was only right to bring Christmas in the kitchen. In red and white. UPDATE: I’ve done a little research to try and track down similar wreaths for you. Mine measure about 5-5 1/2″ from end to end. I ran a search at Amazon and found a variety of mini wreaths in sizes ranging from 4″ to 8″ (click here for the Amazon search results)*. Way back then, I hung them on red ribbons on my then-builder-grade-orangey-oak cabinets. And I called it a day. But this year, I’ve upped the Merry. Very merry much so. 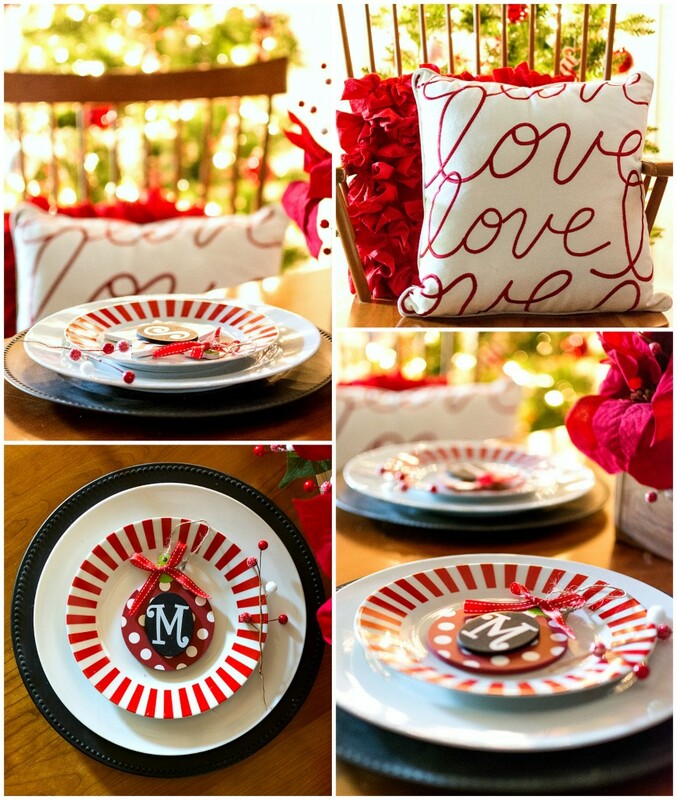 Starting with the 5/8″ red & white candy stripe ribbon* I hung the wreaths from. It makes me smile every morning when I walk into the kitchen. I love looking at my spindley trees while I fill the tea kettle with water. Mini Wreaths (mine measure about 5-5 1/2″ from end to end. 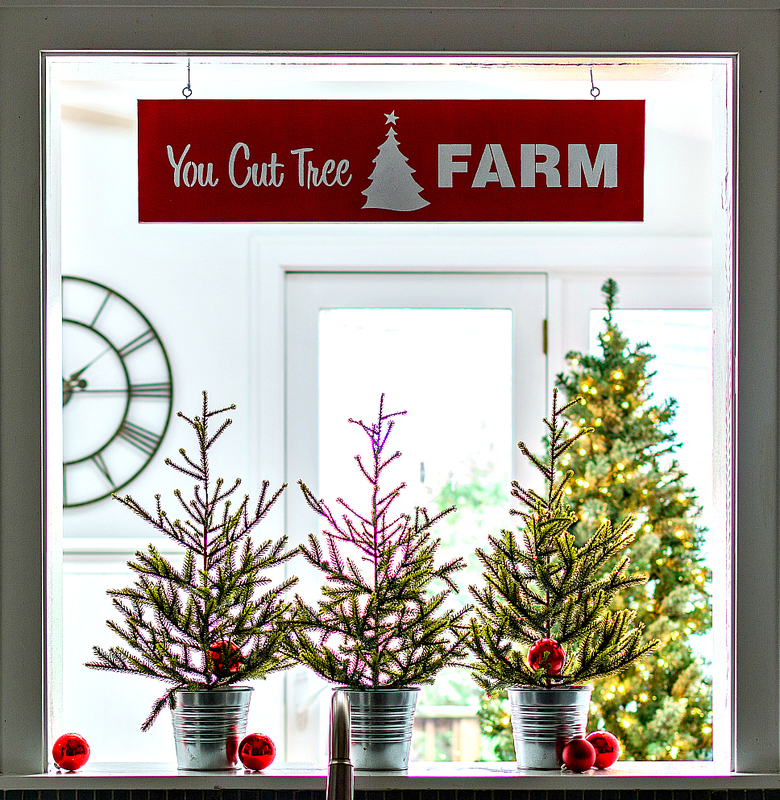 I found 5″ pine wreaths on Amazon (click here). I also found a selection ranging from 4″ – 12″ (click here on Amazon). 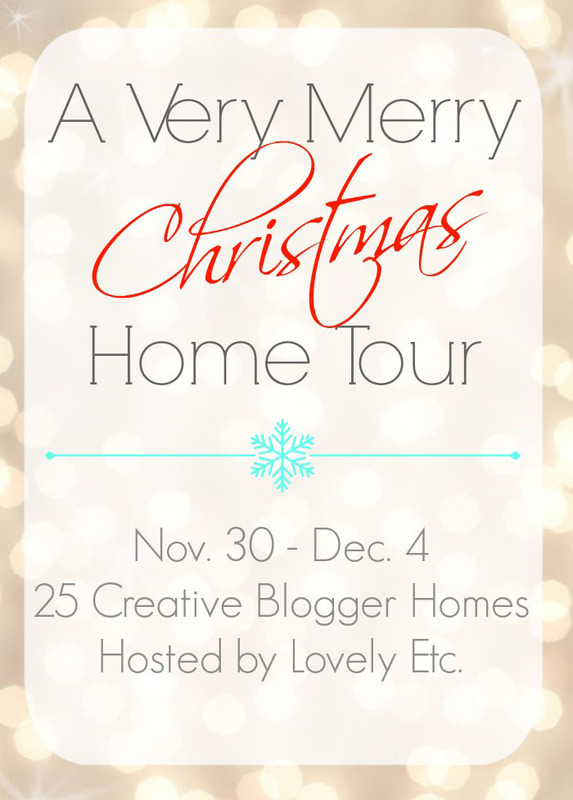 For even more Christmas decorating inspiration, the Very Merry Christmas tour is going on all week long. You can catch a sneak peak from the photos below and follow the links to see everyone’s homes. Pin this graphic so you can find your way back! 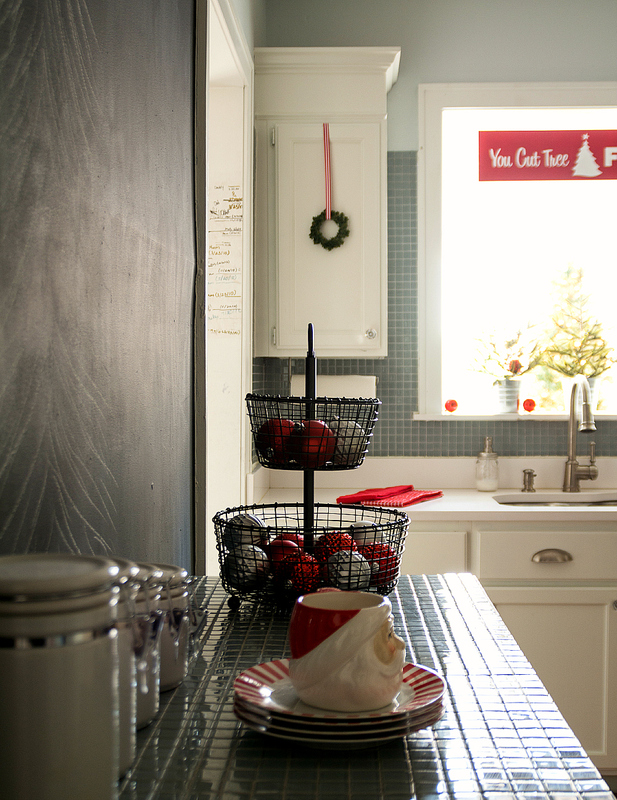 I love that you upped your Christmas in the kitchen, it looks great and I may have even pinned that calendar. your kitchen is beautiful! i love that backsplash- your photography is also so amazing, linda! 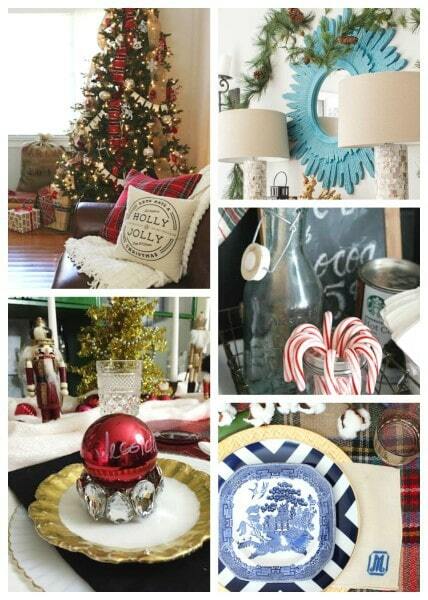 love the christmas touches in there! 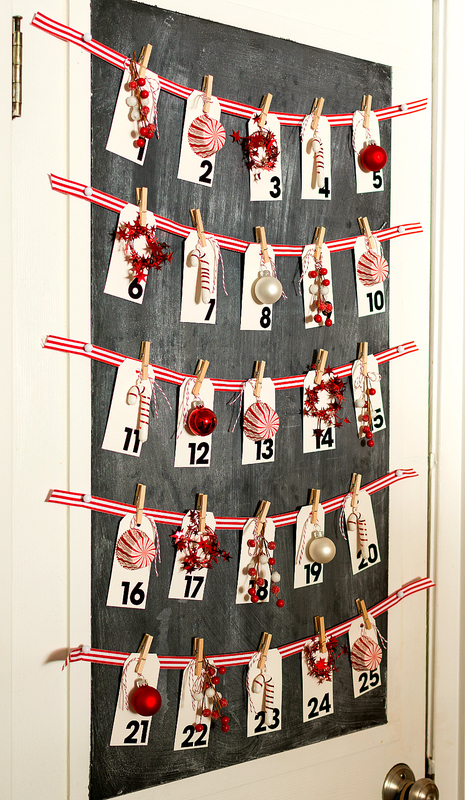 Love the decor in the kitchen, I am especially fond of the Advent calendar! There are so many gorgeous elements in your kitchen that I dont even know where to start. I love everything that you have done. This is definitely getting pinned. 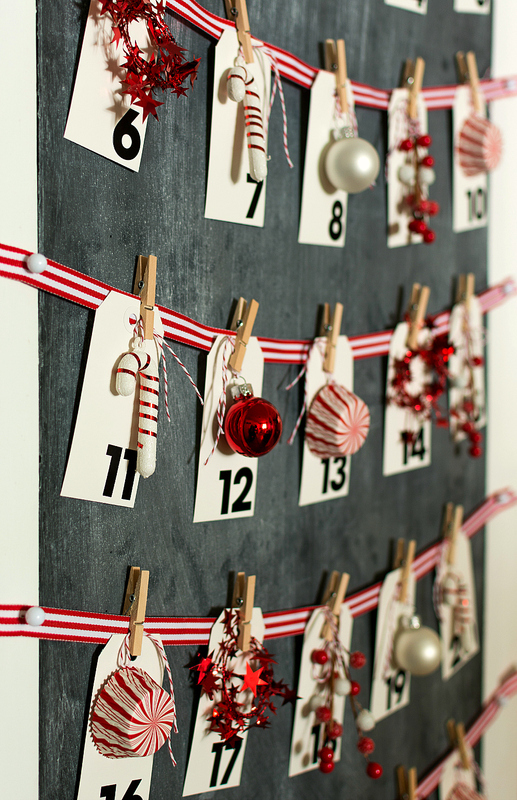 Your advent calendar is amazing!!!! 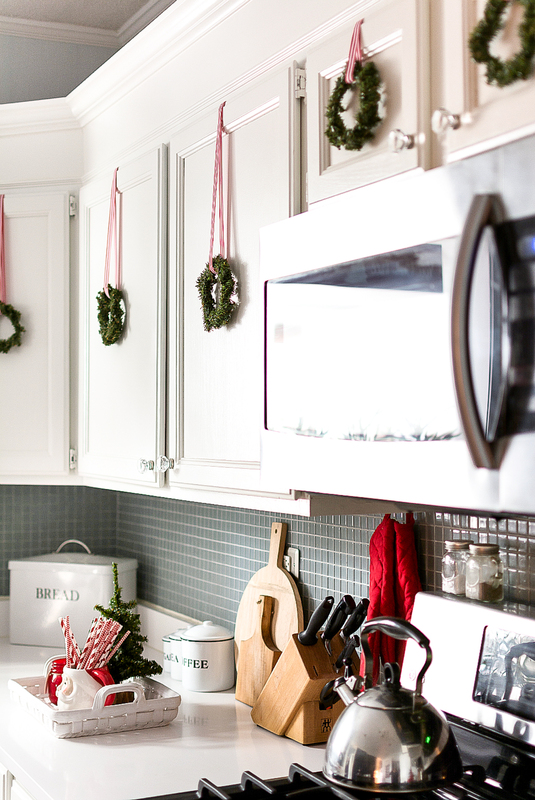 The wreaths on your white cabinets, rock! Beautiful home! So fun, Linda! 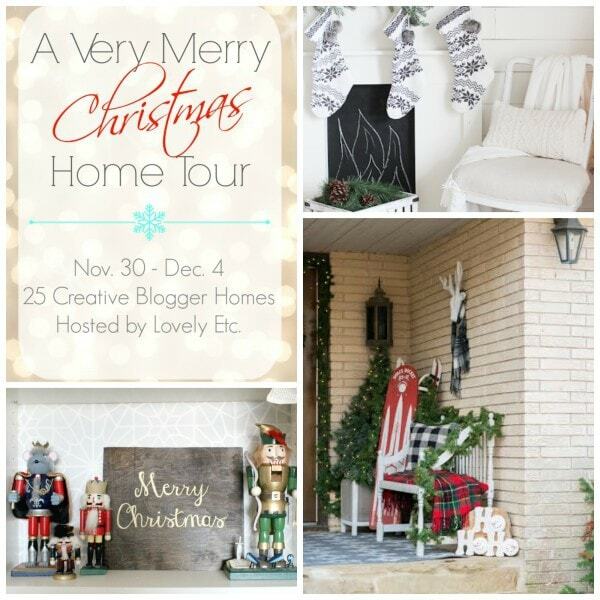 I love the mini wreaths and the little trees and the Christmas tree sign!! I love it- wore out my pinning finger! Such a darling space! I love the color on your walls and how bright your kitchen is! 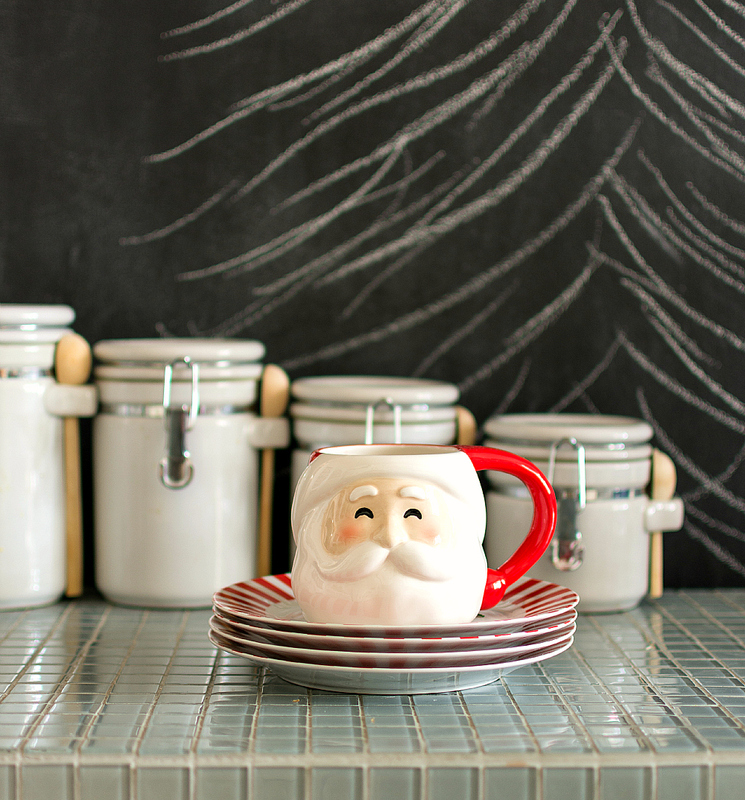 Those little trees in the window, that advent, the Santa mug- too much cuteness in one space! Looks great! 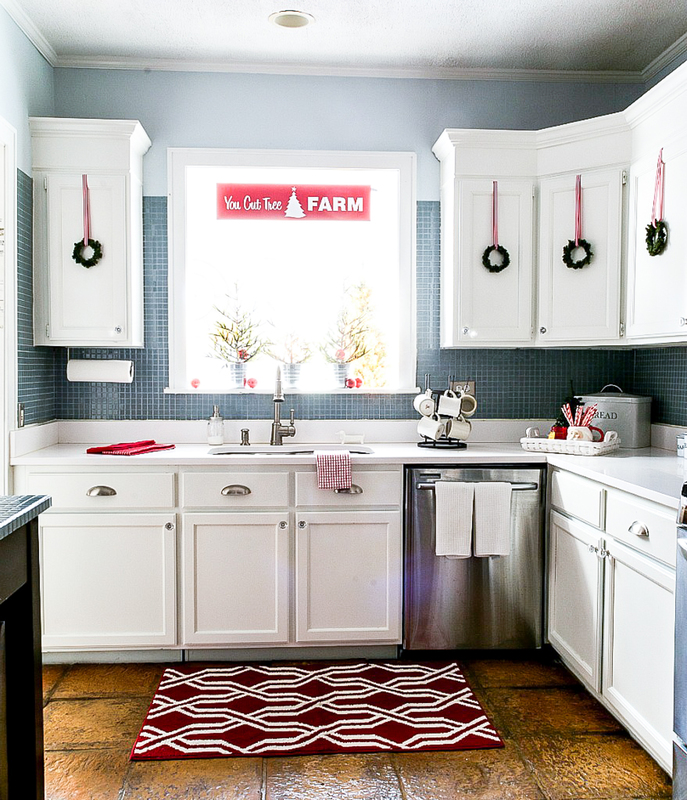 I love all the red and white, and especially those little wreaths on teh white cabinets–perfect! Love your kitchen with the upped style! 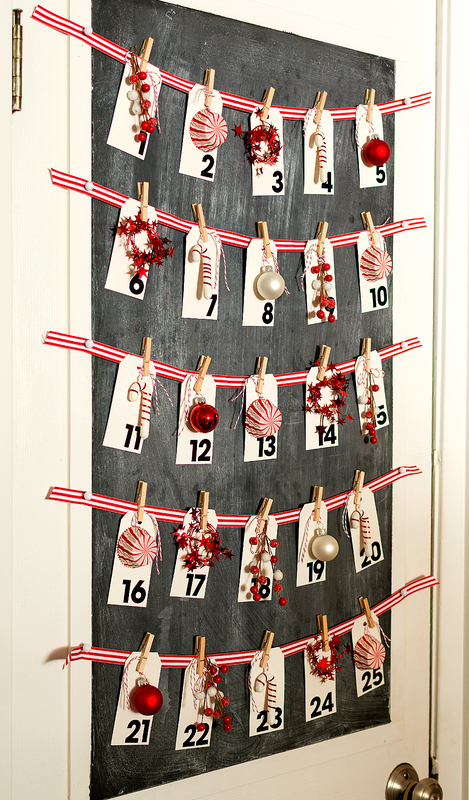 This has to be the cutest most simplistic Christmas decor. I love the vibe of your kitchen. Absolutely beautiful! Your kitchen is absolutely stunning! 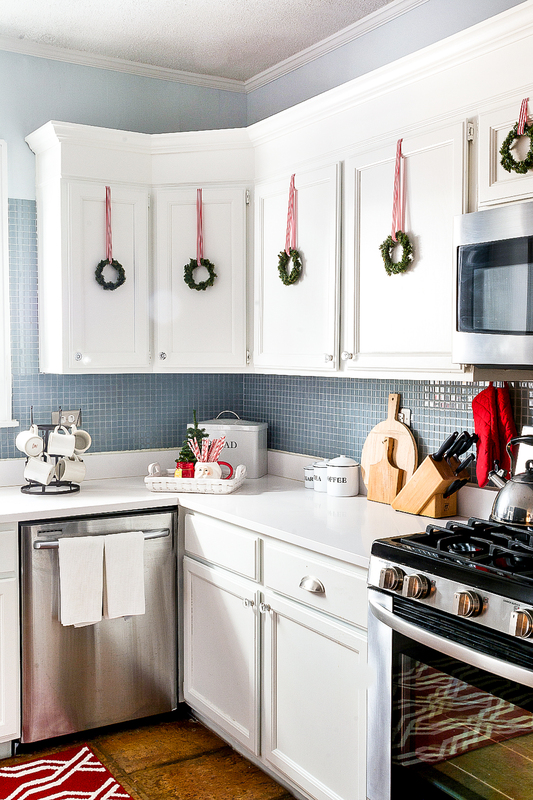 I love how the mini wreaths pop off the crisp, white cabinets. 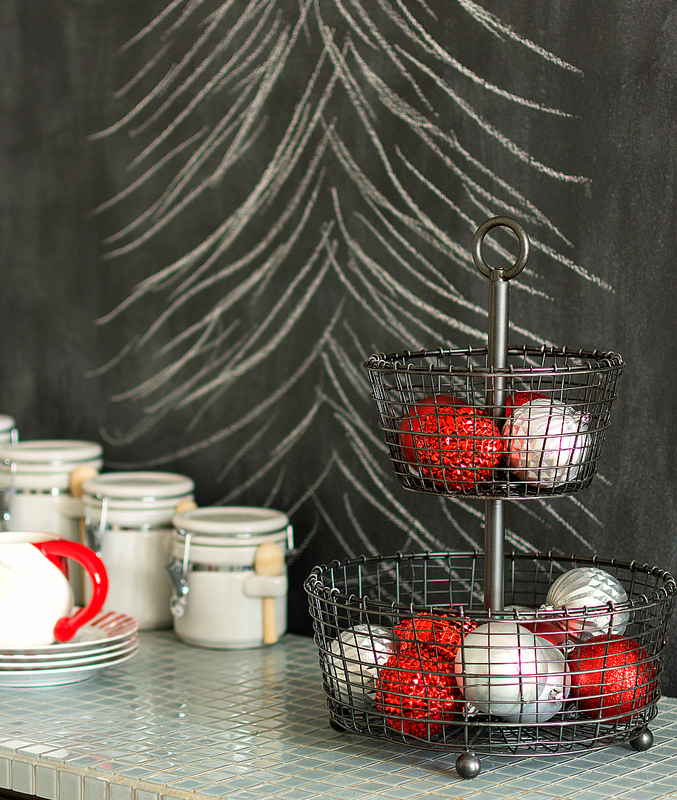 And all the touches of red are so pretty and festive. It’s perfect! I’m a big fan of your kitchen, Linda! The red looks great with your white cabinets. 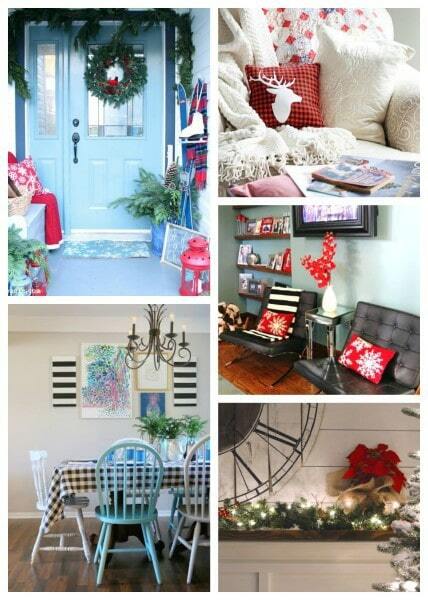 Love the wreaths suspended by peppermint stripe ribbon! It’s all so pretty – love the red and white. May I ask where you got the rug as it’s a perfect touch? Your idea’s were great especially the little wreaths on cabinets never thought of. I love the cabinets and have been wanting to paint mine! Were you able to paint them without sanding? If so, would you mind sharing the technique you used? Looks beautiful. 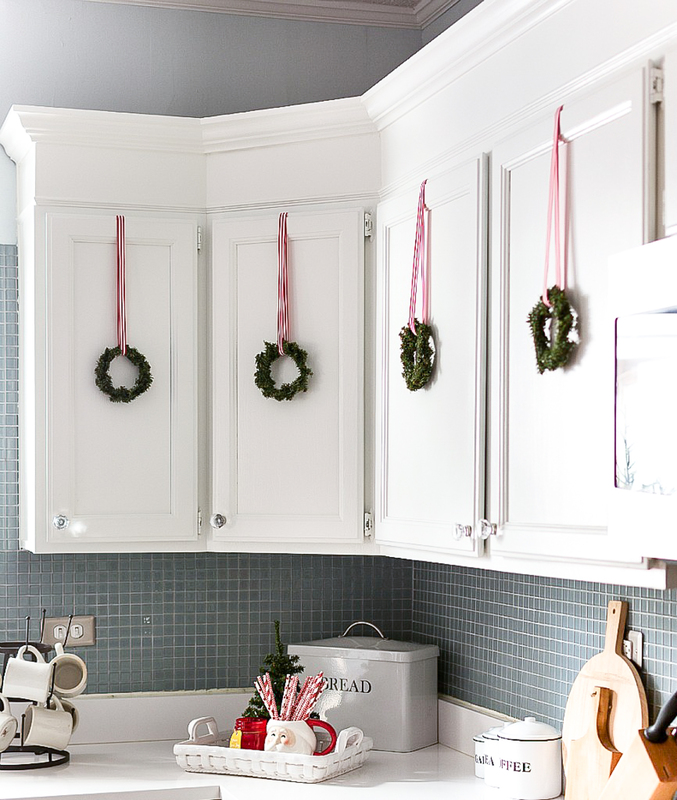 How did you hang/secure the mini wreaths on the cabinets? I’ve used the command strip hooks upside down in the inside of the cabinets but your idea of the tape is great. Love the look. How did you attach the ribbon to the cabinets? Thanks! I just used painter’s tape on the inside of the cabinets to attach. What if you used a command hook upside down on the inside of the door? Some great ideas. No one ever comes to my house and I feel like it isn’t really worth decorating, but seeing this makes me want to decorate this year. Thanks for inspiration. 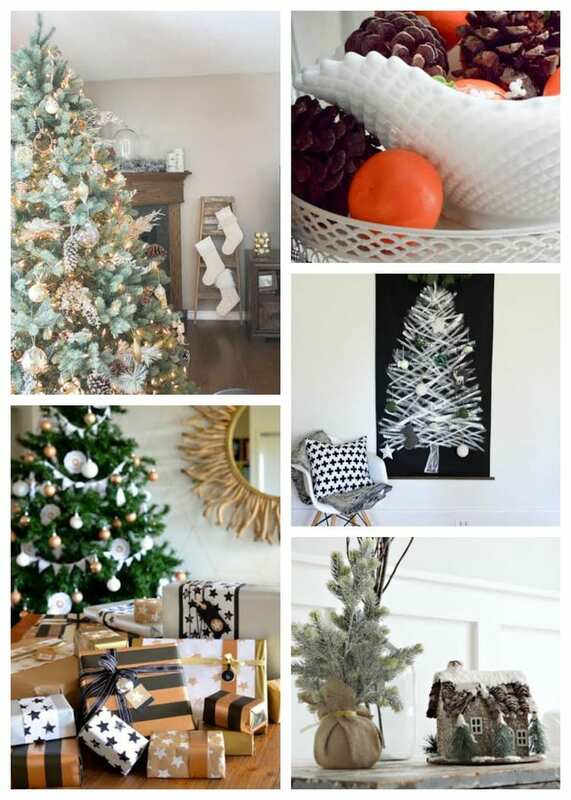 I love your decor and would like to know what size wreath did you use? 4″ or 6″ and size of ribbon, too. Thank you for sharing your ideas/pictures. I actually bought them at IKEA a few years ago. I’m not sure if they’ll offer them again this year, but they tend to stock Xmas early. I love this idea and your kitchen closely resembles mine. I only wish I could paint the cabinets white from the oak they are but we’re hoping to move in the next year but I can decorate for Christmas! So I was wondering if you could tell me where you found the ceramic basket tray? I noticed you didn’t mention it so maybe not but if so I love it so much! I’m looking for wreaths and ribbon like this for my kitchen cabinets. It would just be perfect, but having a hard time finding the right size wreaths. The two you tagged on Amazon aren’t available anymore. I’m so sorry! So many people have been stopping by. My suggestion is to get some faux garland and make your own. 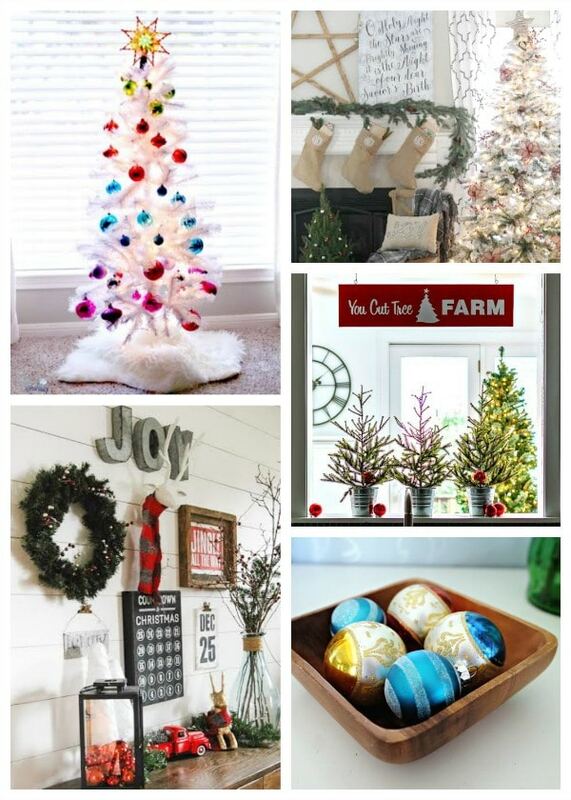 I just ordered some wired garland and will put up a how to make your own soon. How did you connect the ribbon to the cabinet? I just used painter’s tape on the back side of the cabinet. 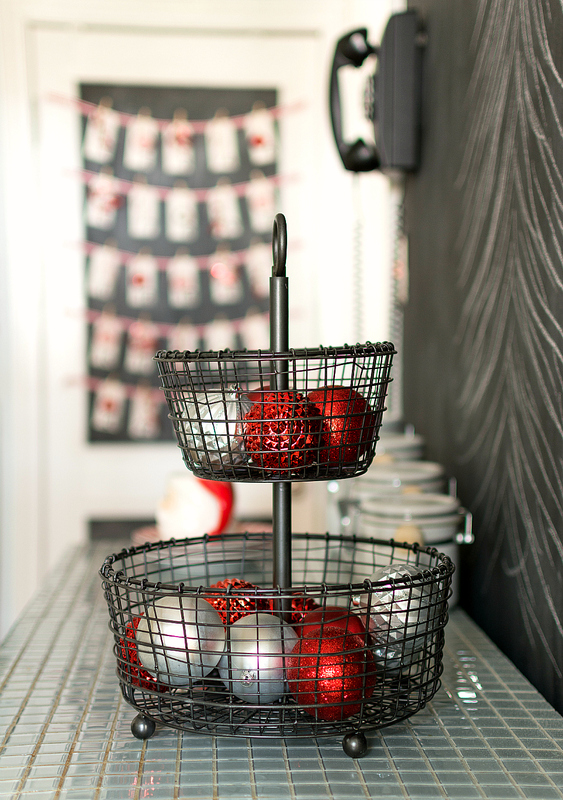 You could also use Command hooks or strips or thumbtacks (if you don’t mind potential damage to the cabinets). Could you please tell me where you got the silver tins the trees are in. Love the look! Thanks! I think I found them at IKEA a few years ago. Yes, definitely IKEA. I just turned one over and looked! They’re called SOKOR. 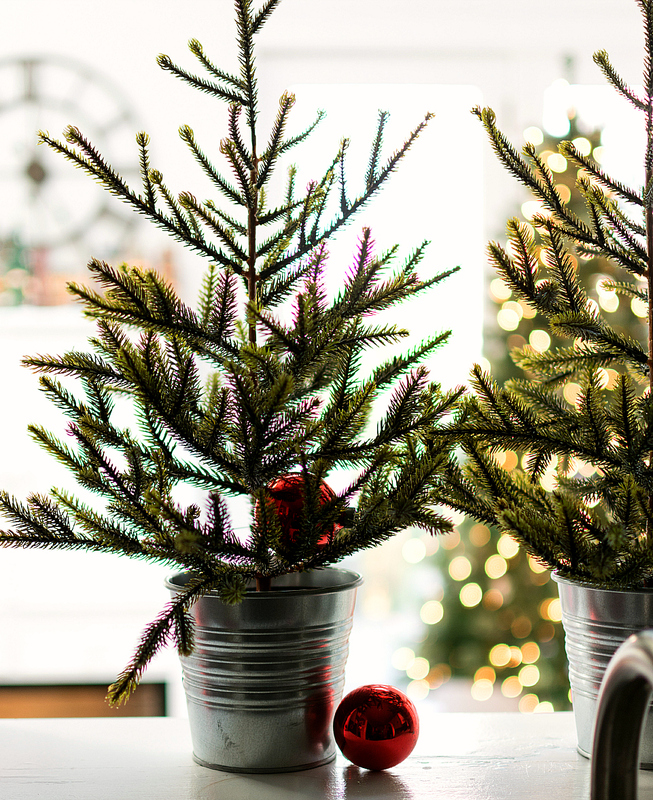 hello – how did you secure the wreaths on the back of the cabinet?